How can a Roman Catholic be sure that Matthew 16:18 proves that the Roman Catholic church is the one true and only Christian church and is infallible in its interpretations of this verse and all Scripture? Catholic answer: Because the Roman Catholic church, which is infallible in interpretation says so! The Roman Catholic Church is the one true and infallible Christian church to declare Matthew 16:18 means that the Roman Catholic Church is the one true and infallible Christian church to declare Matthew 16:18 means that the Roman Catholic Church is the one true and infallible Christian church to declare Matthew 16:18 means that the Roman Catholic Church is the one true and infallible Christian church to declare Matthew 16:18 means that the Roman Catholic Church is the one true and infallible Christian church to declare Matthew 16:18 means that the Roman Catholic Church is the one true and infallible Christian church to declare Matthew 16:18 means that the Roman Catholic Church is the one true and infallible Christian church to declare Matthew 16:18 means that the Roman Catholic Church is the one true and infallible Christian church to declare Matthew 16:18 means that the Roman Catholic Church is the one true and infallible Christian church to declare Matthew 16:18 means that the Roman Catholic Church is the one true and infallible Christian church to declare Matthew 16:18 means that the Roman Catholic Church is the one true and infallible Christian church to declare Matthew 16:18 means that the Roman Catholic Church is the one true and infallible Christian church to declare Matthew 16:18 means that the Roman Catholic Church is the one true and infallible Christian church to declare Matthew 16:18 means that the Roman Catholic Church is the one true and infallible Christian church to declare Matthew 16:18 means that the Roman Catholic Church is the one true and infallible Christian church to declare Matthew 16:18 means that the Roman Catholic Church is the one true and infallible Christian church to declare Matthew 16:18 means that the Roman Catholic Church is the one true and infallible Christian church to declare Matthew 16:18 means that the Roman Catholic Church is the one true and infallible Christian church to declare Matthew 16:18 means that the Roman Catholic Church is the one true and infallible Christian church to declare Matthew 16:18 means that the Roman Catholic Church is the one true and infallible Christian church to declare Matthew 16:18 means that the Roman Catholic Church is the one true and infallible Christian church to declare Matthew 16:18 means that the Roman Catholic Church is the one true and infallible Christian church to declare Matthew 16:18 means that the Roman Catholic Church is the one true and infallible Christian church to declare Matthew 16:18 means that the Roman Catholic Church is the one true and infallible Christian church to declare Matthew 16:18 means that the Roman Catholic Church is the one true and infallible Christian church to declare Matthew 16:18 means that the Roman Catholic Church is the one true and infallible Christian church to declare Matthew 16:18 means that the Roman Catholic Church is the one true and infallible Christian church to declare Matthew 16:18 means that the Roman Catholic Church is the one true and infallible Christian church to declare Matthew 16:18 means that the Roman Catholic Church is the one true and infallible Christian church to declare Matthew 16:18 means that the Roman Catholic Church is the one true and infallible Christian church to declare Matthew 16:18 means that the Roman Catholic Church is the one true and infallible Christian church to declare Matthew 16:18 means that the Roman Catholic Church is the one true and infallible Christian church to declare Matthew 16:18 means that the Roman Catholic Church is the one true and infallible Christian church to declare Matthew 16:18 means that the Roman Catholic Church is the one true and infallible Christian church to declare Matthew 16:18 means that the Roman Catholic Church is the one true and infallible Christian church to declare Matthew 16:18 means that the Roman Catholic Church is the one true and infallible Christian church to declare Matthew 16:18 means that the Roman Catholic Church is the one true and infallible Christian church to declare Matthew 16:18 means that the Roman Catholic Church is the one true and infallible Christian church to declare Matthew 16:18 means that the Roman Catholic Church is the one true and infallible Christian church to declare Matthew 16:18 means that the Roman Catholic Church is the one true and infallible Christian church to declare Matthew 16:18 means that the Roman Catholic Church is the one true and infallible Christian church to declare Matthew 16:18 means that the Roman Catholic Church is the one true and infallible Christian church to declare Matthew 16:18 means that the Roman Catholic Church is the one true and infallible Christian church to declare Matthew 16:18 means that the Roman Catholic Church is the one true and infallible Christian church to declare Matthew 16:18 means that the Roman Catholic Church is the one true and infallible Christian church to declare Matthew 16:18 means that the Roman Catholic Church is the one true and infallible Christian church to declare Matthew 16:18 means that the Roman Catholic Church is the one true and infallible Christian church to declare Matthew 16:18 means that the Roman Catholic Church is the one true and infallible Christian church to declare Matthew 16:18 means that the Roman Catholic Church is the one true and infallible Christian church to declare Matthew 16:18 means that the Roman Catholic Church is the one true and infallible Christian church to declare Matthew 16:18 means that the Roman Catholic Church is the one true and infallible Christian church to declare Matthew 16:18 means that the Roman Catholic Church is the one true and infallible Christian church to declare Matthew 16:18 means that the Roman Catholic Church is the one true and infallible Christian church to declare Matthew 16:18 means that the Roman Catholic Church is the one true and infallible Christian church to declare Matthew 16:18 means that the Roman Catholic Church is the one true and infallible Christian church to declare Matthew 16:18 means that the Roman Catholic Church is the one true and infallible Christian church to declare Matthew 16:18 means that the Roman Catholic Church is the one true and infallible Christian church to declare Matthew 16:18 means that the Roman Catholic Church is the one true and infallible Christian church to declare Matthew 16:18 means that the Roman Catholic Church is the one true and infallible Christian church to declare Matthew 16:18 means that the Roman Catholic Church is the one true and infallible Christian church to declare Matthew 16:18 means that the Roman Catholic Church is the one true and infallible Christian church to declare Matthew 16:18 means that the Roman Catholic Church is the one true and infallible Christian church to declare Matthew 16:18 means that the Roman Catholic Church is the one true and infallible Christian church to declare Matthew 16:18 means that the Roman Catholic Church is the one true and infallible Christian church to declare Matthew 16:18 means that the Roman Catholic Church is the one true and infallible Christian church to declare Matthew 16:18 means that the Roman Catholic Church is the one true and infallible Christian church to declare Matthew 16:18 means that the Roman Catholic Church is the one true and infallible Christian church to declare Matthew 16:18 means that the Roman Catholic Church is the one true and infallible Christian church to declare Matthew 16:18 means that the Roman Catholic Church is the one true and infallible Christian church to declare Matthew 16:18 means that the Roman Catholic Church is the one true and infallible Christian church to declare Matthew 16:18 means that the Roman Catholic Church is the one true and infallible Christian church to declare Matthew 16:18 means that the Roman Catholic Church is the one true and infallible Christian church to declare Matthew 16:18 means that the Roman Catholic Church is the one true and infallible Christian church to declare Matthew 16:18 means that the Roman Catholic Church is the one true and infallible Christian church to declare Matthew 16:18 means that the Roman Catholic Church is the one true and infallible Christian church to declare Matthew 16:18 means that the Roman Catholic Church is the one true and infallible Christian church to declare Matthew 16:18 means that the Roman Catholic Church is the one true and infallible Christian church to declare Matthew 16:18 means that the Roman Catholic Church is the one true and infallible Christian church to declare Matthew 16:18 means that the Roman Catholic Church is the one true and infallible Christian church to declare Matthew 16:18 means that the Roman Catholic Church is the one true and infallible Christian church to declare Matthew 16:18 means that the Roman Catholic Church is the one true and infallible Christian church to declare Matthew 16:18 means that the Roman Catholic Church is the one true and infallible Christian church to declare Matthew 16:18 means that the Roman Catholic Church is the one true and infallible Christian church to declare Matthew 16:18 means that the Roman Catholic Church is the one true and infallible Christian church to declare Matthew 16:18 means that the Roman Catholic Church is the one true and infallible Christian church to declare Matthew 16:18 means that the Roman Catholic Church is the one true and infallible Christian church to declare Matthew 16:18 means that the Roman Catholic Church is the one true and infallible Christian church to declare Matthew 16:18 means that the Roman Catholic Church is the one true and infallible Christian church to declare Matthew 16:18 means that the Roman Catholic Church is the one true and infallible Christian church to declare Matthew 16:18 means that the Roman Catholic Church is the one true and infallible Christian church to declare Matthew 16:18 means that the Roman Catholic Church is the one true and infallible Christian church to declare Matthew 16:18 means that the Roman Catholic Church is the one true and infallible Christian church to declare Matthew 16:18 means that the Roman Catholic Church is the one true and infallible Christian church to declare Matthew 16:18 means that the Roman Catholic Church is the one true and infallible Christian church to declare Matthew 16:18 means that the Roman Catholic Church is the one true and infallible Christian church to declare Matthew 16:18 means that the Roman Catholic Church is the one true and infallible Christian church to declare Matthew 16:18 means that the Roman Catholic Church is the one true and infallible Christian church to declare Matthew 16:18 means that the Roman Catholic Church is the one true and infallible Christian church to declare Matthew 16:18 means that the Roman Catholic Church is the one true and infallible Christian church to declare Matthew 16:18 means that the Roman Catholic Church is the one true and infallible Christian church to declare Matthew 16:18 means that the Roman Catholic Church is the one true and infallible Christian church to declare Matthew 16:18 means that the Roman Catholic Church is the one true and infallible Christian church to declare Matthew 16:18 means that the Roman Catholic Church is the one true and infallible Christian church to declare Matthew 16:18 means that the Roman Catholic Church is the one true and infallible Christian church to declare Matthew 16:18 means that the Roman Catholic Church is the one true and infallible Christian church to declare Matthew 16:18 means that the Roman Catholic Church is the one true and infallible Christian church to declare Matthew 16:18 means that the Roman Catholic Church is the one true and infallible Christian church to declare Matthew 16:18 means that the Roman Catholic Church is the one true and infallible Christian church to declare Matthew 16:18 means that the Roman Catholic Church is the one true and infallible Christian church to declare Matthew 16:18 means that the Roman Catholic Church is the one true and infallible Christian church to declare Matthew 16:18 means that the Roman Catholic Church is the one true and infallible Christian church to declare Matthew 16:18 means that the Roman Catholic Church is the one true and infallible Christian church to declare Matthew 16:18 means that the Roman Catholic Church is the one true and infallible Christian church to declare Matthew 16:18 means that the Roman Catholic Church is the one true and infallible Christian church to declare Matthew 16:18 means that the Roman Catholic Church is the one true and infallible Christian church to declare Matthew 16:18 means that the Roman Catholic Church is the one true and infallible Christian church to declare Matthew 16:18 means that the Roman Catholic Church is the one true and infallible Christian church to declare Matthew 16:18 means that the Roman Catholic Church is the one true and infallible Christian church to declare Matthew 16:18 means that the Roman Catholic Church is the one true and infallible Christian church to declare Matthew 16:18 means that the Roman Catholic Church is the one true and infallible Christian church to declare Matthew 16:18 means that the Roman Catholic Church is the one true and infallible Christian church to declare Matthew 16:18 means that the Roman Catholic Church is the one true and infallible Christian church to declare Matthew 16:18 means that the Roman Catholic Church is the one true and infallible Christian church to declare Matthew 16:18 means that the Roman Catholic Church is the one true and infallible Christian church to declare Matthew 16:18 means that the Roman Catholic Church is the one true and infallible Christian church to declare Matthew 16:18 means that the Roman Catholic Church is the one true and infallible Christian church to declare Matthew 16:18 means that the Roman Catholic Church is the one true and infallible Christian church to declare Matthew 16:18 means that the Roman Catholic Church is the one true and infallible Christian church to declare Matthew 16:18 means that the Roman Catholic Church is the one true and infallible Christian church to declare Matthew 16:18 means that the Roman Catholic Church is the one true and infallible Christian church to declare Matthew 16:18 means that the Roman Catholic Church is the one true and infallible Christian church to declare Matthew 16:18 means that the Roman Catholic Church is the one true and infallible Christian church to declare Matthew 16:18 means that the Roman Catholic Church is the one true and infallible Christian church to declare Matthew 16:18 means that the Roman Catholic Church is the one true and infallible Christian church to declare Matthew 16:18 means that … do you want to read this again? The Roman Catholic church does this to defend what is only an empty claim for this church to exalt itself above the word of God, the Holy Scriptures. LETS FACE IT! It is a far stretch to go from the words of Matthew 16:18 to conclude the great boasts the Roman Catholic church makes about herself. THE FACT IS that the words spoken by our Lord Jesus Christ in this verse never meant anything at all by our Lord that the Roman Catholic church has twisted them into and has taught others about them. THERE IS NO PROOF here that the Roman Catholic church is Christ’s true and only church and the infallible interpreter of the Holy Scriptures of God. THERE MUST BE, therefore, a way to understand and interpret the Scriptures correctly and there is!… By learning the meaning of the words of the Holy Bible from its divine Author, the Holy Spirit of God. You say that He is the Christ, the Son of the living God. But do you say that He is the Rock that His church is built on? Matthew 16:13-20… The passage context of the Matthew 16:18 verse! The name Peter in greek means “small stone” and he is a stone TOO SMALL for Christ’s church to be built on. The text of Christ’s words is in the ancient greek language. Jesus was able to speak this language as shown by His quotes of the ancient Greek Septuagint version of the Holy Scriptures. According to ancient sources, The Gospel of Matthew was originally written in both Hebrew and Greek by Matthew. This gospel had been accepted as God’s Holy Word in both languages. There is no known existing copy of Matthew’s gospel in Hebrew any longer, therefore, we do not know what Jesus’ words here were exactly in Hebrew/Aramaic. However, we do see Jesus’ words in God’s Holy Word in the Greek language as the rest of the New Testament had been written. Therefore, we have God’s testimony preserved, through His word, of the true meaning of the words of His Son in the Greek text. Also, the topic of conversation here is NOT who Peter is but who JESUS is! The ROCK that Christ’s church is built on is what Peter had just said, “Thou art the Christ, the Son of the living God.” While Peter’s confession of Jesus being the Christ is present in passages in parallel gospels of this event (Mark 8:27-30 and Luke 9:18-21), Jesus’ confession “That thou art Peter, and upon this rock I will build my church” is not present in these other gospels. 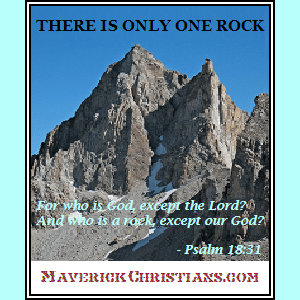 The Bible always refers to God and Jesus as the Rock. 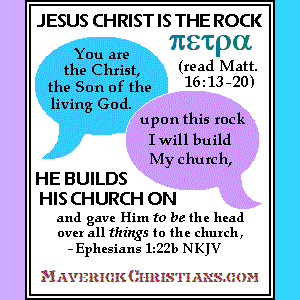 If people will not yield to double talk, it becomes quite obvious that Matthew 16:18 never says that Peter is the rock on which Christ’s church is built. Changing of pronouns in the Bible is significant. Many times we see such in the Old Testament referring to the divine Son of God. However, here we see the words of Jesus “I say unto” involving the first person of the statement, which is, “Thou art Peter,”. The second person of the statement “and upon this rock” refers to a third person. 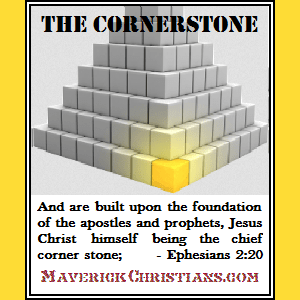 If Peter was the rock on which the Church is built, then why didn’t Jesus say “upon YOU I will build my church”? It has been pointed out that Jesus did NOT say, “You are Peter, and the Bishop of Rome is your exclusive successor and has universal, ordinary jurisdiction in every church in the whole world.” The rock the church of Christ is built on, therefore, is the faith of Peter, not his flesh. Over this “rocky” play on words Jesus used it has presumed by many that Peter must be that rock on which Christ’s church, even though He didn’t say this verbatim. This presumptive conclusion remains yet for many to put this to the test. It does stand all the more to be questioned as such great boasts have been made by the Roman Catholic church about itself over their own interpretation of this one Bible verse. The Holy Bible makes very clear who the Rock is that the Church is built on in Ephesians 2:19-20, saying, “Now therefore ye are no more strangers and foreigners, but fellowcitizens with the saints, and of the household of God; And are built upon the foundation of the apostles and prophets, Jesus Christ himself being the chief corner stone;” No explanation needs to be given here and no later writings change this. The entire false claim for the Roman Catholic church as Christ’s true church pivots on the one Bible verse of Matthew 16:18. This verse has been taken out-of-context from the text of what Jesus was saying, out-of-context from the rest of Scripture and out-of-context of the original Greek language. This one Bible verse is too weak a peg to hold up and justify the entire system of Roman Catholicism. The boast that popes are the successors to Peter’s apostleship are empty. 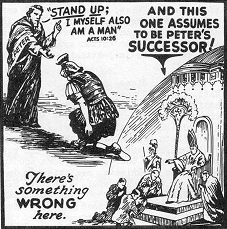 Succession to Peter’s office as Apostle is never mentioned in God’s Word, the Holy Scriptures, much less ever mentioned as being roman popes. Christ’s church, in fact, is everyone who has placed their trusting faith in Him alone for salvation despite what denomination church they belong to. Do not build your faith on a foundation of a small stone that cannot support you. Trust in Jesus, the real Rock, for your salvation. Be free from the addiction of trusting the Roman Catholic church for your salvation. Trust Jesus Himself alone, He did ALL the work to save you!